This is the part II of freezing food post. I had covered the Menu planning, Shopping things for Menu, and Cooking Strategy in the Freezing Food Part I post. In this post, we will look at Cooking Strategy, Packing and Freezing, Consuming the food. I created this blog post by taking all your questions and have answered them to my best in part I and Part II. If there is any question that I have not covered in the post, I have answered it separately at the bottom of the post. If you still have questions, please do comment in my blog post. Do check my Facebook (https://www.facebook.com/Dishesfrommykitchen/) and Instagram (https://www.instagram.com/dishesfrommykitchen/?hl=en) for regular updates of day to day cooking and lunch boxes. I am by no means saying that you must do it the way I have shown here. Please try to understand and follow what works for you. Test in small batches before you do it for large portions. Disclaimer: I am not an expert on freezing food or a nutritionist. The outcome of freezing food is dependent on various factors like temperature of the refrigerator, temperature of the house, type of food etc. Shopping for Vegetables: Do the vegetable shopping the day before you plan on cooking. The idea is not to store the vegetables for long time before cooking. Planning the cooking: Based on the time it takes for you to cook, breakdown the items into manageable groups. Also identify the common things needed for cooking all your dishes and account for those to be done in one shot. For example, ginger-garlic paste can be prepared in one shot. I prepared ginger-garlic paste and chutneys before the other cooking. I planned my cooking for 2 full days and broke the items accordingly. 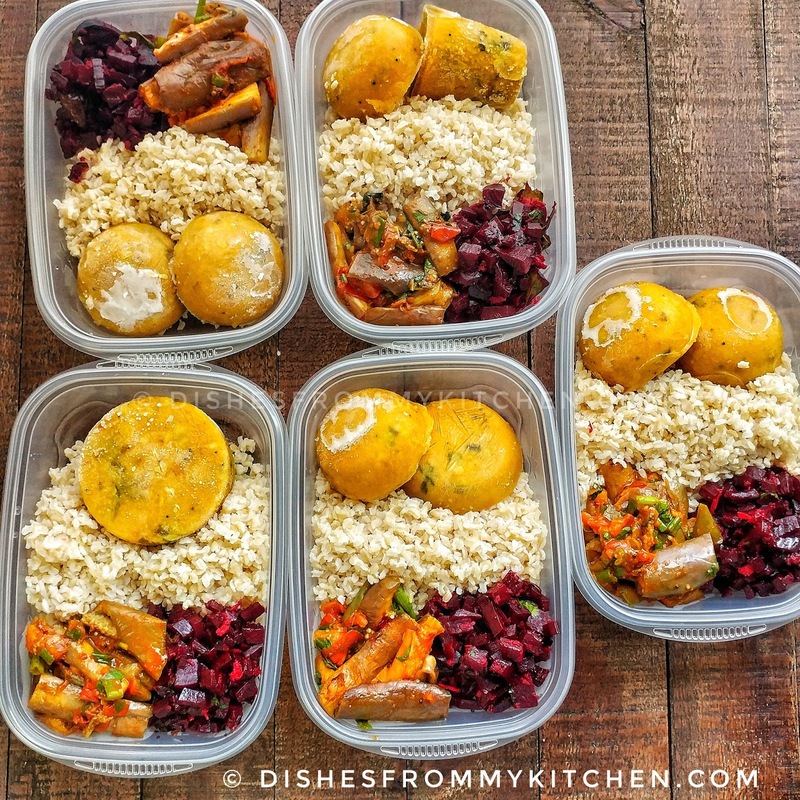 Timing the cooking: Its best to do the cooking and freezing closer to the date you start your trip, so that it reduces additional days the food is going to be in the freezer. After cooking the food, it is important to properly fill the food into the containers for freezing. First thing is to portion the cooked food into portion sizes based on the number of portions. It is important to wait for the cooked food to cool to room temperature. Make sure you don’t leave the food for longer than 2 hours after cooking. 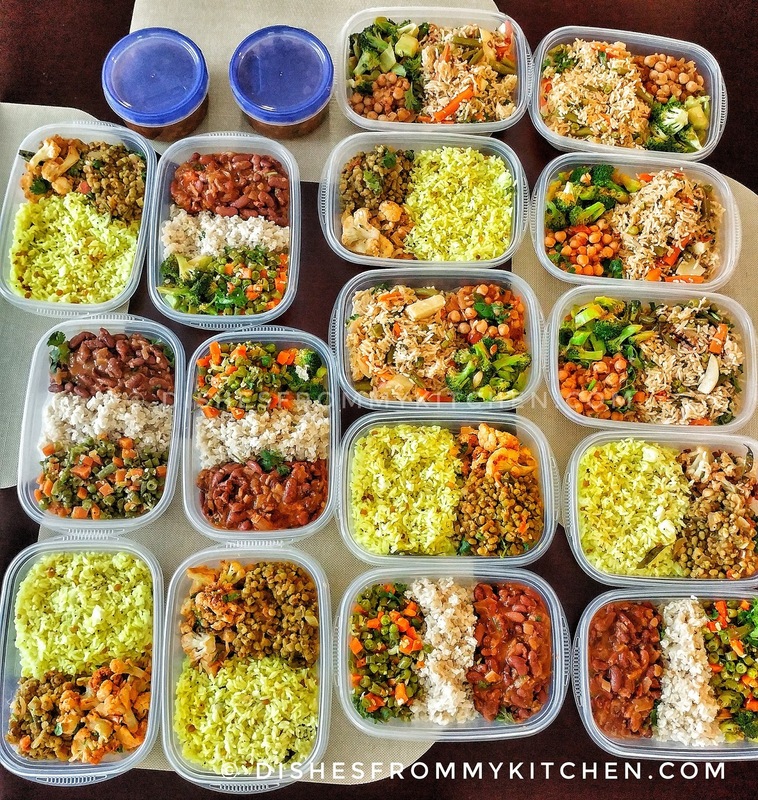 Fill the food into the freezer containers and then store them into the freezer (before storing into freezer make sure the food is cool, if you feel it is still warm put the boxes into the fridge until it cools down and then transfer to the freezer). *** Its best to freeze food when it is still fresh so that it tastes the same way when it is defrosted. *** After you fill all the boxes into the freezer, open the freezer only when needed. Frequently opening the freezer is going to reduce the shelf life of the food. 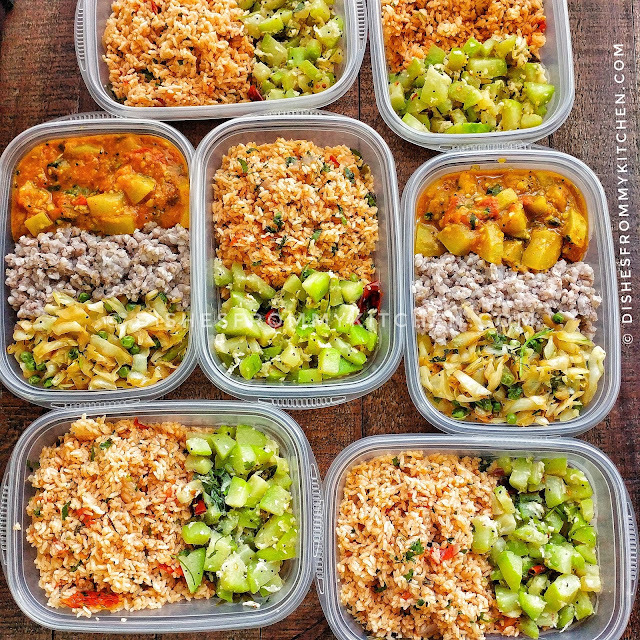 To minimize wastage of food, plan and store the portion sizes based on your individual needs. So that you have the right amount per meal, the reason being that if there is unconsumed food it cannot be re-freeze. I froze the chutney by storing into the ice cube tray and covered them with cling wrap. After it is solidified unmold them and store into the freezer Ziploc bags. 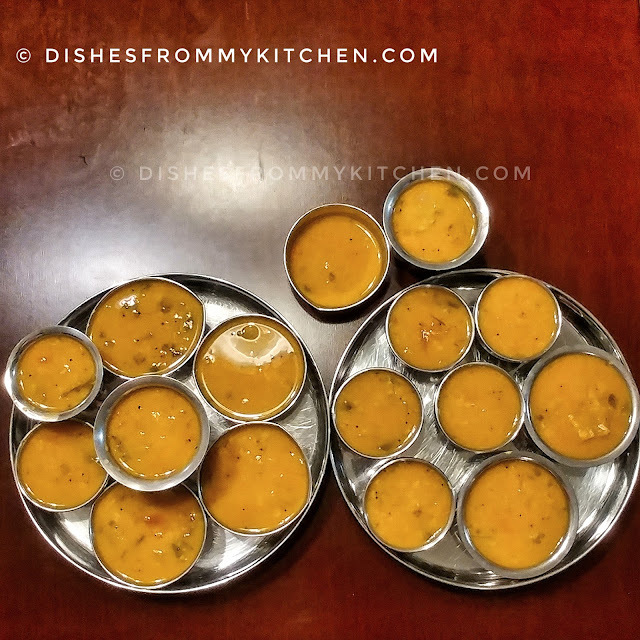 For Sambar, I followed the same process as the chutney, but stored them in small cups instead of ice cube trays. *** Label the boxes with a sharpie before storing into the freezer. I labelled it with the name of the food item stored. 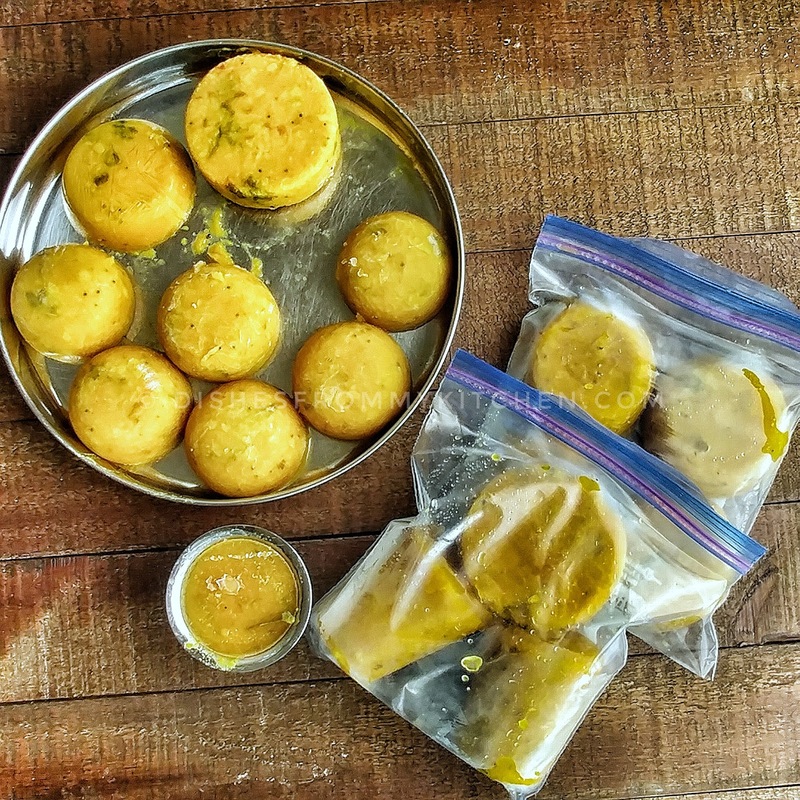 I cling wrapped individual muffins/sandwiches and stored them in the freezer bag. The banana bread I stored them in individual freezer bag as per the serving quantity. *** Do not choose breads that are very soft for the sandwiches, because it will make the sandwich soggy. 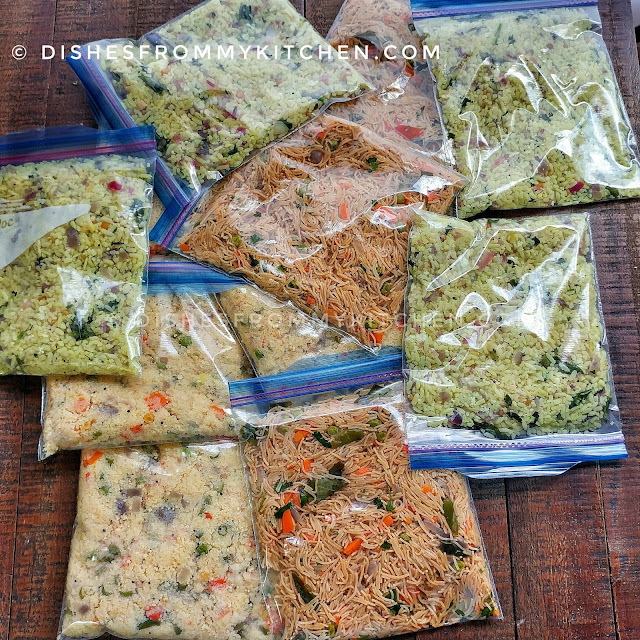 *** Make sure there is no air in the freezer Ziploc bag after filling the food. Also flatten the Ziploc bag after storing the food, so that it freezes evenly and makes storage easy. ATTENTION! Do Not re-freeze unconsumed food. It is important to plan your consumption. If you plan to consume the food for breakfast or lunch, take those boxes and put in the fridge the night before going to bed. In the morning after getting up take the breakfast box and put it outside the fridge and microwave it before you eat. Take the box for lunch from refrigerator 2 to 2.5 hours before consumption. When you get ready to eat, warm it in the microwave. You are ready for a scrumptious breakfast and lunch! For dinner, take the box from the freezer in the morning and put it in the fridge. Take the box from the fridge 2 to 2.5 hours before consumption. Microwave before eating. For consuming the Chapathi, do it like a frozen Chapathi. I will try to share how to freeze Chapathi in a future post. For idli, transfer the idli into a glass container and sprinkle few drops of water on the idli before warming it. Close it with a lid while warming in the microwave. It is very important not to overheat any of the food stuffs, which will make the food dry. You can warm for a short period and check and determine if you need it to be warmed more. Anything stored in freezer Ziploc, should be transferred to glass container and covered before warming. If the freezer boxes you use can be microwaved, then you can directly warm the box in microwave. If not transfer the contents to a glass container and warm it. *** After warming and consuming it, if you have left over food DO NOT REFREEZE or REFRIGERATE. It is best to throw it away. This is what I follow. Depending on the food/meal that should be consumed first Eg. Muffins, Sandwich and Banana bread should be consumed first compared to Idli and other breakfast foods. I created a time table which says what to eat for breakfast, lunch and dinner for the 30 days. The idea is to spread out the foods so that it does not feel like a repetition of the same thing. I emptied the freezer for this purpose and stored the food. Make sure the label on the Ziploc/boxes faces outwards. 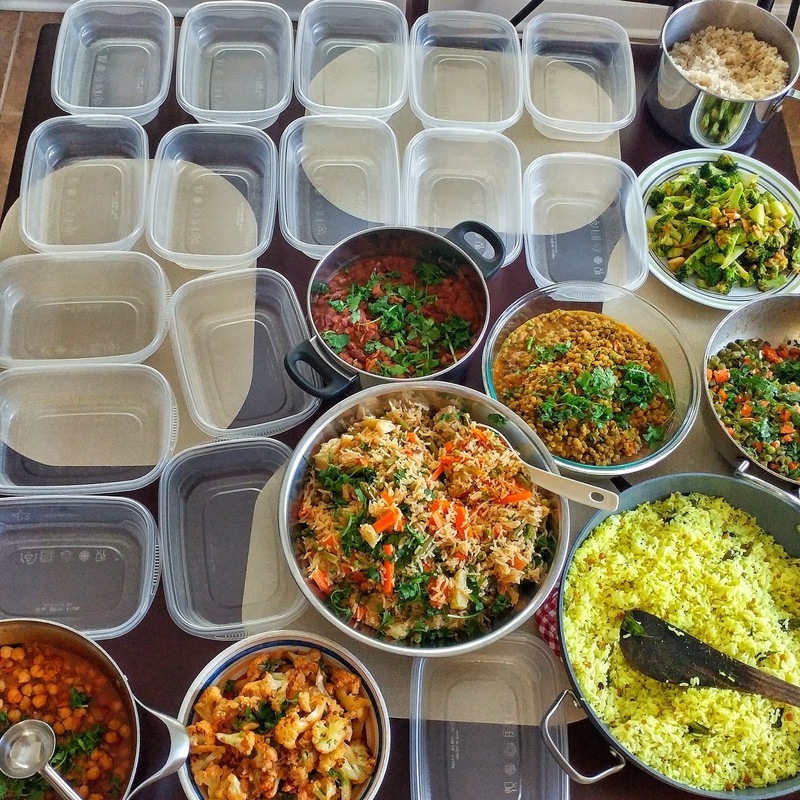 Group foods by Category like breakfast, lunches, dinners, Chapathi, chutneys and Curries. You can also store the food in the chest freezer if you have one. I stored them in my refrigerator freezer. As I said I did not had any plans on doing blog post on this so I did not take any pictures of my freezer. How long will I store these foods? I kept it for 30 days and it worked for me. Beyond that, there are various factors which play a part. How do you freeze rice and defrost? Portion size the cooked rice and freeze it. Defrost them when needed. Please refer to the post for more specific details on the same. Yes, it tastes the same. Can we freeze roti atta? Freezing means deep freeze or just refrigerating?? I freeze in the freezer compartment of the refrigerator. Do you add any preservatives?? Items like onion, coconut ... Will you add them yet food will be fresh after freezing and heating? Yes. I used onion and frozen coconut in my dishes. I did not have a problem. Is the rice here half cooked? The rice is fully cooked. Make sure anything you cook is not mushy. Can you let us know how to store Chapathi? I will do it as a separate post. Is oven mandatory for reheating; Are all the dishes are fully cooked or require couple more steps before eating? Yes, microwave is needed for reheating. All dishes are fully cooked and no additional steps are needed. If you don’t have a microwave, you can warm it on the stove top provided your items are frozen individually. Will food lose its nutritional value when frozen or refrigerated? I am not a nutritionist, so I cannot answer your question. Based on my research in the Internet, I found that the nutritional value is not lost if cooked and frozen correctly. Moreover, freezing is not a regular activity in our house and it is only done very rarely based on situations. The bottom line is freezing home cooked food and eating is better than eating outside food for 3 times a day for 30 days. You are welcome to do your own research. Considering Indian power cuts, would you suggest freezing? I mean, can the food stay good with 2-3 hours of power cuts (it may get partially thawed)? Power cut is a big problem for freezing food. If you know power cuts will happen, then my suggestion is not to freeze food. Can we freeze almost everything we cook? Even the ones with tomatoes as one of the ingredients? I am not a specialist of freezing. I did my research on the things that I planned to cook as to seeing if they can be frozen or not. Please do your research based on what you plan to cook. Yes, my dishes had tomatoes as ingredients. Yes please, for someone who value food, also don't believe in throwing away leftovers, these are the great tips I am hailing.